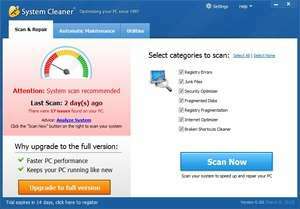 System Cleaner 5 is a PC tool which as the title might suggest, clean your system of outdated registry valies, thereby ensuring that your Windows 7 PC runs at peak performance. The program is simple to get around in and features a Quick Maintenance wizard which gets your PC cleaned up in a few easy steps. System Cleaner 5 also includes some more advanced options for users who know what they are doing; Apart from the registry cleaner, System Cleaner also includes a disk cleaner for removing clutter from your hard drive(s) which frees up some space; a registry defragger which helps when your registry has become fragmented and some other tools like a file shredder. For security reasons, you should also check out the System Cleaner download at LO4D.com which includes virus and malware tests. Additional screenshots of this application download may be available, too. System Cleaner has a presence on social networks.